Published: Mar 19, 2017 - Modified: Apr 17, 2019 - by Chef Rodney - Leave a Comment - This post contains Ads & Affiliate Links. Cinnamon Sugar Beaver Tails? What the heck is that and what is it doing on a Food blog? Growing up in Ottawa, Canada, I spent many hours skating on the world’s longest skating rink. They used to have these little huts on the ice that sold coffee, hot apple cider and… beaver tails. At the time it was a yummy pastry that you could get with different toppings like jam, sugar and cinnamon or garlic and cheese. Apparently it’s now a big business. When I started writing my cookbook and launching this food blog, I went on a mission to find a recipe for authentic beaver tails. This recipe is inspired by several others floating around the internet. In a large bowl, mix the yeast, warm water and 1/4 Tsp of sugar. Allow to stand a couple of minutes to allow yeast to swell and dissolve. Depending on various factors (temperature, humidity, etc.) this could take as long as 10 minutes. Add the 1/3 Cup of sugar, milk, vanilla, eggs, oil, salt, and most of the flour to the yeast mixture. Knead for 5 to 8 minutes using a dough hook, adding flour as needed to form a firm smooth, elastic dough. Place dough in a lightly greased bowl. Place warm towel on top of bowl and "seal". If you are not going to use the dough right away, you can refrigerate the dough at this point. Let rise for about 30 to 40 minutes. Pinch off a golf ball sized piece of dough. Roll out onto a floored surface into an oval and let rest, covered with a tea towel, while you are preparing the remaining dough. Heat about 4 inches of corn oil in fryer (or whatever you usually use for frying). Temperature of the oil should be about 385 degrees. Stretch the ovals into a tail shape, like a beavers tail, thinning them out and enlarging them as you do. Add the dough pieces to the hot oil one at a time. Turn the beaver tail once to fry until both sides are deep brown. Lift the beaver tails out with tongs and drain on paper towels. Fill a large bowl with a few cups of white sugar and cinnamon. 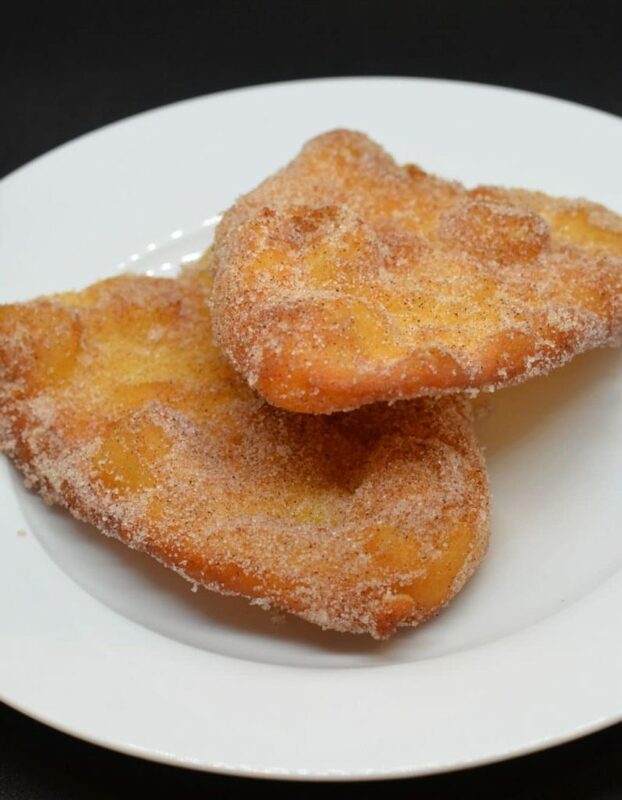 Toss the beaver tails in the sugar mixture, coating both sides and then shake off the excess.